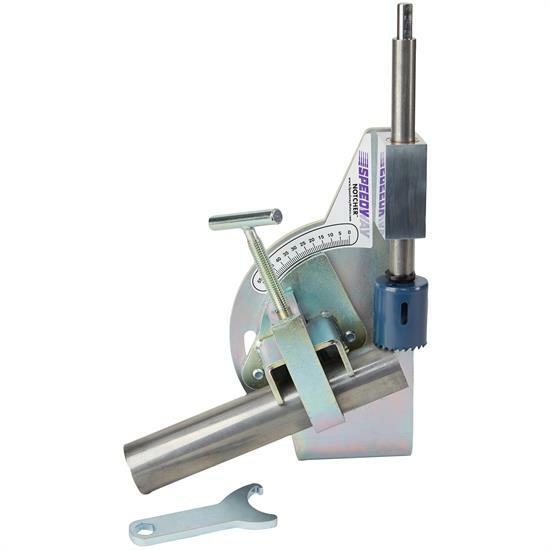 Makes angled tubing joints from 40° to 90° quickly and accurately. Is a must have for making custom roll cages and exhaust headers/manifolds. Works well with 9/16" to 2" O.D. tubing and is useful in joining different sized tubing. Compatible with drill press or 1/2" power drill. Spanner wrench, 1-3/4" hole saw blade, and threaded reducer are included. Prior to initial use, it may be necessary to rotate the tubing holding bracket fixture into the proper position in order to match up the tubing cradle in the bracket with the V-bracket. Please see above pictures for proper bracket positioning illustration.